This coming Sunday, the first leg of the 2014 Korean Triple Crown will be run at Busan Racecourse. And just like the Triple Crown itself, the KRA Cup Mile is a relatively new addition to the Korean racing calendar. It was run in September, wasn’t called the KRA Cup Mile and wasn’t restricted to Korean-bred 3-year-olds. The race was won by US bred Siseon Jeap (Precise End). The following year, the race was renamed as the KRA Chairman’s race and was run over the Korean Derby distance of 9 furlongs. Another US import Golding (Gold Alert), who went on to become a stalwart of the track all the way up until 2011 took the honours. In 2007, the race moved to June and back in distance to a mile and was given the name KRA Cup Mile. In a memorable race, Australian jockey Garry Baker rode the 6-year-old mare Luna (Concept Win) to victory. Luna, who had broken down aged 2 and was never expected to race again, would later have her story (very) loosely made into a movie. That year, J.S.Hold had won all three legs of the Triple Crown. However, he only faced Seoul horses and the first leg had been the Ttukseom Cup. In 2008, with the Busan track coming of age, for the first time runners from both Seoul and Busan would be eligible for the Triple Crown races and it was decided that the KRA Cup Mile was the ideal first leg – a Korean 2000 Guineas. The first Classic to be run at Busan was won by a Busan horse. However, Rainmaker went on to finish 8th in the Derby the following month and never won a race again despite running on for 2 years. Now a minor stallion at Stud. The only filly to win since the race became part of the Triple Crown, she’s also the only winner of this race to go on to win the Korean Derby. She went on to win multiple Stakes before retiring. Delivered a foal by Menifee in 2012. Romped to an 11-length victory and is to date the only visitor from Seoul to win the race. 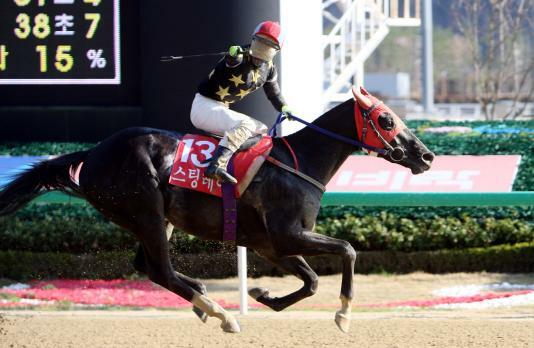 He was caught right on the line in the Derby by Cheonnyeon Daero and only ran once more. Like Rainmaker now a minor stallion. A comfortable winner at odds of 7/1, Soseuldaemun turned up for the Derby having lost a lot of weight and didn’t run well. He was retired after his 3-year-old season. A 3-length winner, he finished 3rd in the Derby and has gone on to be one of the top performers in the country, running in almost every big Stakes race, recording wins in the Busan Owners’ Cup and Busan Ilbo and a 2nd in the President’s Cup. Ranked the number 2 Korean bred horse in the country right now behind Grand Prix winner Indie Band. His dam was a Korean Stakes winner and while Sting Ray performed so badly for the rest of the year after the Cup Mile he got himself gelded, he was back in the winner’s circle at class 1 earlier this month. The Korean Baseball season gets underway this weekend and this, like the beginning of the English Cricket season, can mean only one thing – It’s going to rain! Unlike the Rounders, however, Racing continues in the wet. In fact, the heavier the rain, the more both track attendance and betting turnover tend to increase. 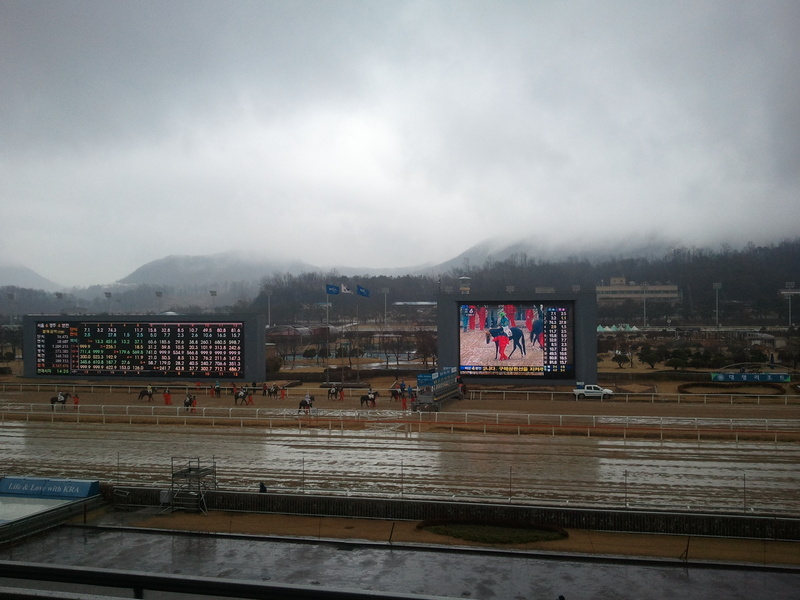 There were no problems with the weather during the first of the weekend’s cards at Busan this afternoon. Joe Fujii kept the foreign end up, riding a pair of winners although the Japanese jockey was outshone by local You Hyun Myung who continued his recent run of good form by finishing his way to the winner’s circle on 4 occasions. South African trainer Bart Rice also continued his good start to life at Busan with another winner; Seungni Wave (Pico Central) doing the business in race 3. In the 7-furlong feature race, Oreuse (Smoke Glacken) got his 2nd Class 1 win in the space of a month. And for the 2nd time, trailing in behind him was the highly-rated 3-year-old Cowboy Son (Cowboy Cal). We’re just 12 days away from the first leg of the 2014 Korean Triple Crown. Currently 19 horses remain in the KRA Cup Mile – the “Korean 2000 Guineas” – which will be run at Busan Racecourse on Sunday April 6. OF those 19 – which will be cut to a maximum of 16 by final declarations next Wednesday, Busan supplies 11 while 8 are planning to make the trip down the Gyeongbu Expressway from Seoul. Only one horse from the capital, Money Car in 2010, has triumphed in the race to date. Busan’s foreign trainers Peter Wolsley and Bart Rice are represented respectively by Heukgangja and Gangchi while last year’s Champion Juveniles Jungang Gongju (Busan) Raon Morris (Seoul) and Cheongyong Bisang (Overall) are all expected to be present. 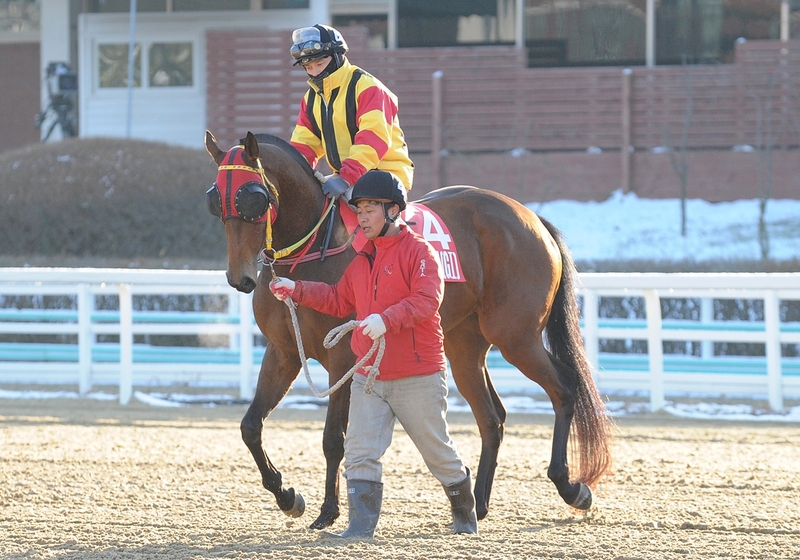 Jungang Gongju is among 7 fillies still in the race. Another, Winner’s Marine, is the only entrant who heads to the race unbeaten, having won all of her 5 starts to date. It’s not been an easy few months for Jo Sung Gon. Things got a little better for Busan’s Champion Jockey this weekend though as he finally made it into the winner’s circle in Macau. The victory came on his 42nd ride at Taipa Racecourse since taking up a 6-month license in January. And a perfectly timed ride it was too, swooping late on Aussie bred Golden Number One (Happy Giggle) to steal the 1100 metre race 6 on Saturday right on the winning line. The undisputed number one Korean jockey at Busan, Jo has found opportunities hard to come by in Macau – Golden Number One paid $160.50 on the Macau tote – but no doubt will benefit for the experience in the long-term. In Korea, Jo Sung Gon has ridden 480 winners including the Korean Derby, Korean Oaks and three successive President’s Cups – Korea’s richest race – on Dangdae Bulpae. He’s currently stable jockey to Australian trainer Peter Wolsley. 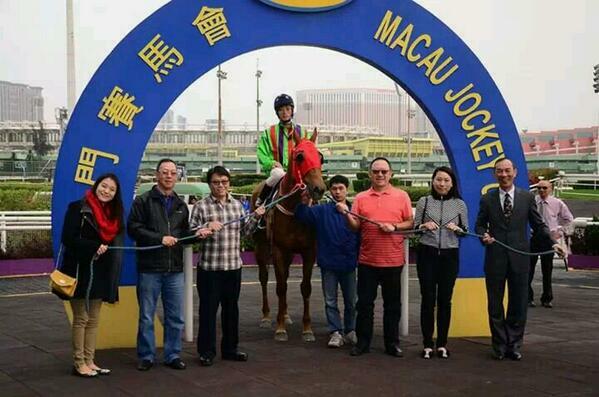 Click here for race result and replay from the Macau Jockey Club. Mari Daemul and Magic Dancer both bounced back from recent reverses to claim the feature races at Seoul and Busan respectively today. 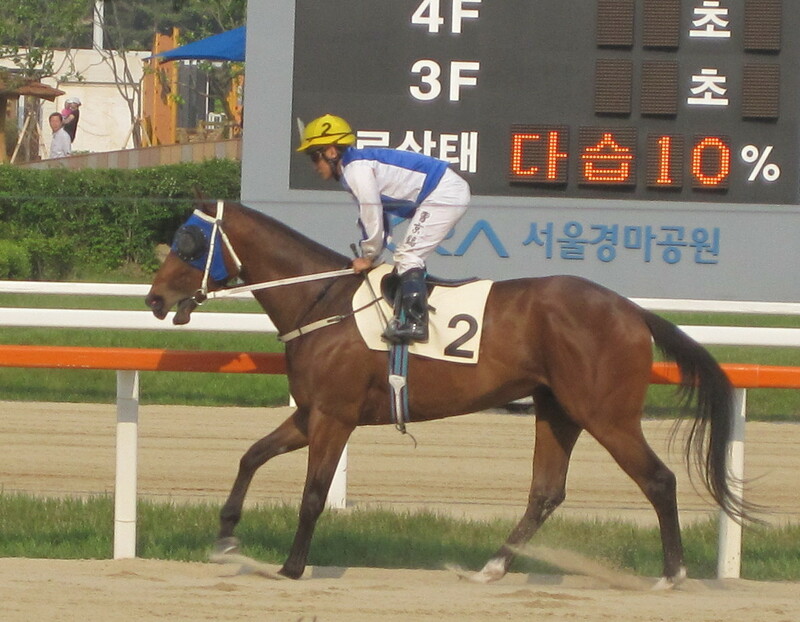 KRA Cup Classic winner Mari Daemul has flopped in the Grand Prix Stakes at the tail-end of last year and could only manage third place on his season-debut last month. However, that didn’t stop him from being sent off the even-money favourite for Seoul’s feature, which included a host of the track’s top class 1 horses. Ultimately, Mari Daemul (Go For Gin) was the comfortable winner, scoring a 3-length victory over fellow US import Unbeatable (Eddington). Former Grand Prix winner and one-time Horse of the Year Tough Win (Yonaguska) was a neck back in third. Talented but frustratingly inconsistent, it was an 8th win from 23 starts for the 5-year-old Mari Daemul. Down at Busan, Magic Dancer (Forest Camp) was given few problems by his own class 1 rivals. The 4-year-old colt could only manage 4th place in the Busan Ilbo Cup last month but was untroubled today, seeing off Cheogang Dancer – to who he was conceding 8kg – by half a length. In other races at Seoul, highly rated filly Clean Up Speed (Pico Central) landed her 4th win from 6 starts and her first around two turns. Although not entered for the KRA Cup Mile at Busan in two week’s time, she must be considered among the potentials for the year’s later Classics. Clean Up Speed also provided the third in a treble of winners for Ikuyasu Kurakane. The Japanese jockey reached a milestone 200 Korean winners last weekend and shows no signs of slowing down. It’s been a mild week in Korea and the fine weather should continue on a busy weekend of racing. Tough Win makes his season-debut on Sunday. 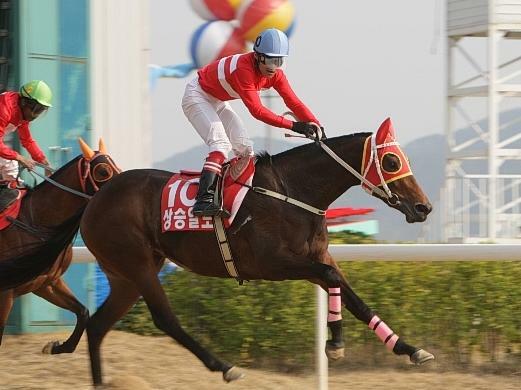 Now 7-years-old, he is 3 races without a win and possibly on the wane and faces KRA Cup Classic winner Mari Daemul and up and comer Samjeong Bulpae over 1900 metres. Busan’s feature race is also on Sunday when Magic Dancer will be looking to get back to winning ways in a class 1 handicap. Ikuyasu Kurakane reached a major milestone over the weekend, when he became the first foreign jockey to ride 200 winners in Korea. His two victories across the weekend, on Big Show on Saturday and Ms. Celtic Senior on Sunday, took the Japanese rider to 201 victories from 1711 rides across two stints riding on the peninsula. Now 38, Kurakane originally came to Korea in 2007 and spent a successful 18 months riding at Seoul and Busan. During this period he won what remains his only Stakes race to date, the 2007 Nonghyup Trophy on Pilseung Giwon. 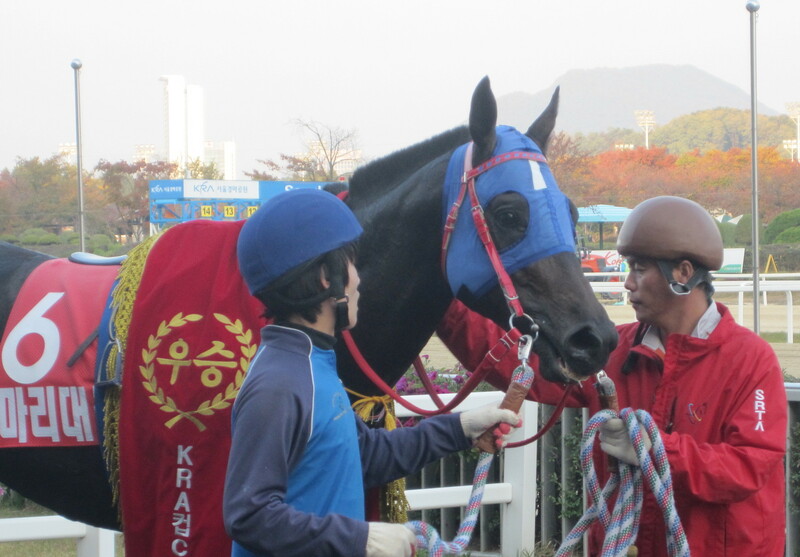 Kurakane returned to Seoul in April last year and quickly established himself as among the track’s top riders. His feat is made all the more impressive in that the vast majority of his winners have come at Seoul, a track where he is the only foreign jockey to have enjoyed even moderate success. At Busan, it is a different story although still by means easy for the visitors. Kurakane’s license has been extended by 6-months, as have those of Busan-based trio Darryll Holland, Joe Fujii and Masa Tanaka. Royal Ascot winning rider Holland is the KRA’s marquee jockey and after overcoming a challenging first few months, he’s now reaping he benefits, taking out another feature race at Busan on Sunday and is currently in 2nd place in the Busan Championship. Grand Prix Stakes, Korean Derby and Oaks winner Fujii is just two places back. Tanaka too is a regular visitor to the winner’s circle. The “foreign jockey quinella” is now a very popular bet among punters. In the barn at Busan things are going well too. After his 2nd place finish last year, Peter Wolsley currently leads the 2014 Trainers’ Championship in numbers of winners – ahead of even the Kim Young Kwan machine. Meanwhile, South African Bart Rice has made an impressive start with 5 of his 23 runners to date returning victorious. Korea is still a very difficult place for foreign jockeys to ride as the recent experiences of Jerome Lermyte and Fausto Durso show, making the achievements of the likes of Kurakane even more notable.